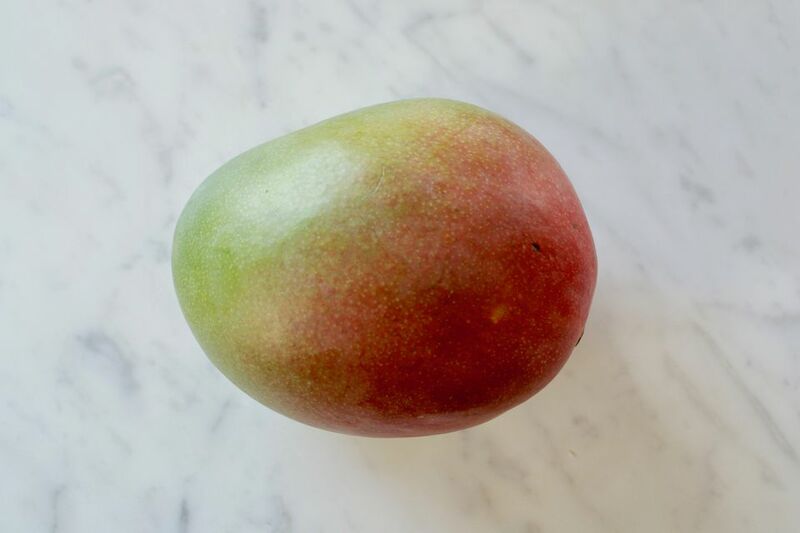 First things first: You need to start with a ripe mango. Different types of mangoes will look different when ripe, but all will yield slightly if you gently push the flesh. Hold the mango in your hand and gently tighten your grip to see if the fruit gives just a bit; if so, that means it is ripe. Ripe mangoes feel heavy for their size and give off a lovely aroma when they're ready to eat. If the mango feels mushy it is overripe; if it is rock hard it needs more time to ripen. The first step to cutting the mango is to cut off one of the sides. Hold the mango so it is standing up on the cutting board. Use a sharp knife to cut the mango down one side, just to the right (or left, if you're left-handed) of the center. It's as if you're cutting the mango in half, but just off-center. Why off-center? Because you're cutting around the tough, inedible pit in the middle of the fruit. If your knife meets resistance or you sense a tougher texture, this means you are hitting the pit; move the cut further out from the center. Now you need to do the same to the other side of the fruit. Turn the mango so you can cut it lengthwise on the other side. You now have 2 mango "halves." Depending on the size of your mango, there may be plenty of meat still left around the pit. Feel free to cut off 1/2- to 1-inch strips along the two other sides of the mango around the pit. 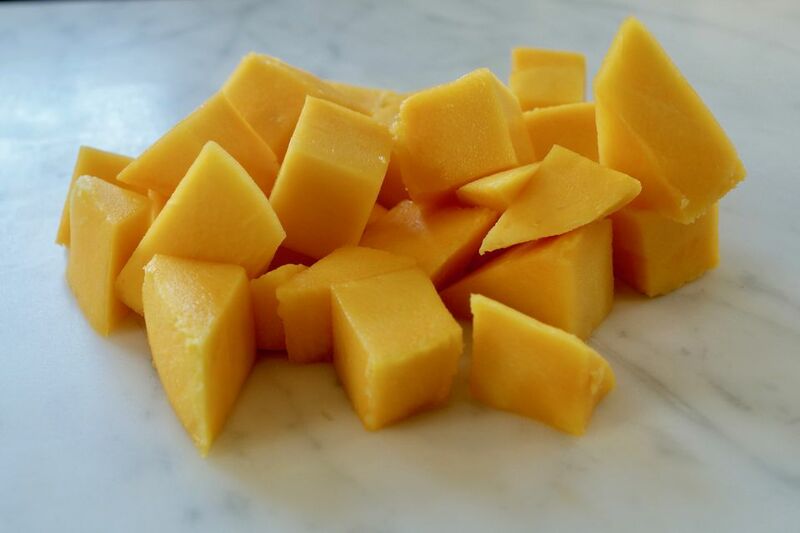 In order to easily cut the fruit into cubes, you first need to score each mango half. Score the mango according to what kind of pieces you want in the end. For example, close-together lines will create a smaller dice, perfect to toss in a mango salsa, and more spread-out lines will make large dice and slices, ideal for fruit salad or eating as is. You can either score the mango with the peel against a cutting surface or if you're more comfortable with a knife, score while holding it in your hand. Just be extremely careful not to cut through the peel and slice your skin! Use the tip of a sharp knife or a paring knife to slice down through the flesh making sure not to cut through the skin. Score each mango half lengthwise into 3 or 4 even sections. (If you want mango slices, move on to the next step.) Now score each mango half crosswise, creating cubes. Now that the mango is scored into pieces, turn the flesh inside out so each section of scored mango sticks out. At this point, if you are just eating the fruit yourself, you could go ahead and bite off each piece. For a more formal use of mango, you need to cut off the mango cubes. Using a sharp knife, run the blade against the inside of the peel to cut off each piece of scored mango. Do this either over a cutting board or bowl. Eat the mango as is, use it in a fruit salad, or spoon it on top of yogurt or ice cream. Or turn the mango into mango lassis, a fruity version of a mint lassi. Just whirl chopped mango in a blender with yogurt and a bit of lime juice. Add ice for a slushy effect. You can also use your diced mango in a mango passionfruit tart, mango cake, or ice cream. But this fruit is not only for sweet dishes and desserts; mango can add delicious flavor and wonderful texture to savory recipes, particularly those with Thai origin.